Mark Crakanthorp answers readers’ questions. Lantana is a noxious weed currently covering more than 4 million ha of Australia’s east coast. Lantana is one of the worst weeds in the world. In Australia, it ranks high on the list of Weeds of National Significance. Lantana earned this infamous title through their ability to colonise prime agricultural land and also strangle the understory of some of our most valuable remnant bush and forest. For the hobby farmer, as well as degrading land, lantana is highly poisonous to stock – particularly cattle, horses and sheep. Animals raised around lantana innately know not to touch it. But new stock can be susceptible. Stock may also ingest lantana if no other feed is available. 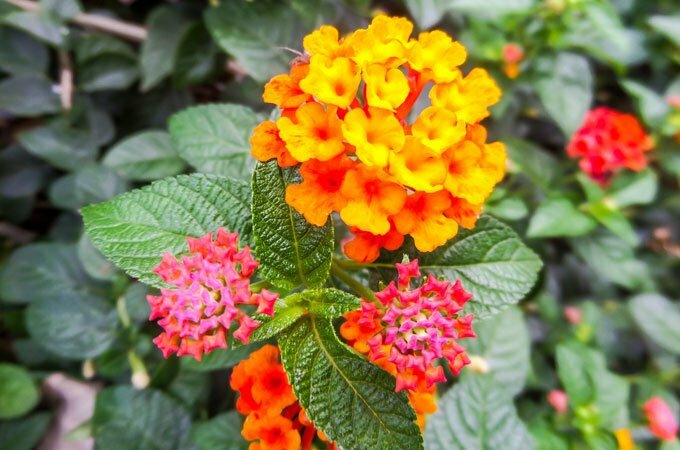 An easily identifiable symptom of lantana poisoning is photosensitivity. In suspected cases of poisoning, veterinarian assistance must be sought quickly. Lantana poisoning is often fatal without treatment. Controlling lantana is hard work, particularly where tractor access is difficult, like creeks and gullies. But, when found along fences and in isolated clumps, mechanical control is very cost effective. The best time to get stuck into lantana is when the soil is moist. If using manual or mechanical controls, the roots will pull a lot more easily from the soil. It also generally ties in with good growing conditions. This means an integrated approach incorporating herbicide or even fire can be aded to your arsenal. Lantana is very persistent. It is a prolific seeder and new suckers establish quickly from the roots. The success of any eradication plan will depend on effective follow up in subsequent years to weaken the suckers, kill the seedlings and prevent flowering to exhaust the seed bank in the soil. Tailor your control methods to suit your goals. Many customers want to preserve remnant vegetation or encourange back wildlife by replanting forest tree species. Others wish purely to reclaim farming land. If using a tractor, the best plan would be to ‘scalp’ the soil surface with the bucket to try and remove as much of the plant as possible – roots and all. The jaw action of the 4-in-1 bucket is ideal for grasping the stems and pulling out the large, established root clumps with it. The result will be a lot of biomass, which needs to be pushed up into rows or stacks for burning. The next step would be to unearth as many of the remaining root clumps as you can. This is known as grubbing. 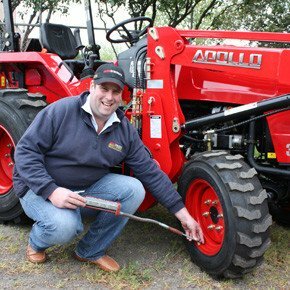 Our AGMAX box scraper is a perfect candidate for the task. The rippers are well designed to bring the deeper, more entrenched roots to the surface. Pile the roots up to dry and later, burn them. It is inevitable that you will encounter vigorous regrowth. A cost effective tip is to sow the area down to a few fast growing pasture to compete for nutrients and sunlight, further weakening remaining root clumps. Now that lantana is more manageable, you can keep it under control with regular flail mowing/slashing to weaken the remaining root clumps and prevent seeding. Herbicides can be part of your integrated approach. The most effective strategy following removal is painting remaining stems with a concentrated herbicide. This is a time consuming method, but if done correctly, works very well. High volume spraying and low volume splatter spraying have their place as well, but be aware of your proximity to waterways and sensitive flora, particularly if you are using a penetrant or surfactant in combination. There are a number of herbicides registered for use to control lantana. Please seek professional advice on which herbicide best suits your goals. For herbicide applications, aim for healthy, growing plants that have not flowered. When using foliar herbicides, leave the poisoned plant intact. Some herbicides are active in the stems and soil for a relatively long time, so let it translocate to the roots. CAUTION: Always refer to the manufacturer’s label for correct usage and application rates. The label will bring attention to other constraints to usage, like applying herbicide to stressed plants.